Over half a century of providing quality care. McNabb's Service and Repairs is a full service family run business that has been providing quality auto service in the Lehigh Valley since 1958. 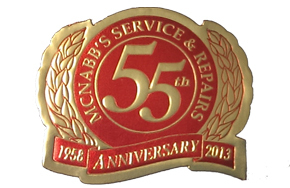 While other auto repair businesses come and go, McNabb's Service & Repairs on Hamilton Boulevard and Brookside Road, Wescosville, has built a reputation over 50 years and three generations for reliable and friendly service. The business started a half century ago by Allen McNabb and is now run by his son Brent McNabb and his wife Cindy. Brent's mother Mary Ann and son Gabe are also a part of the business. Times may change, but our commitment to providing our customers with excellence in our work and customer service has stayed the same. Bring your car to McNabb's and see the difference for yourself. We offer convenient hours and 24 hour drop off.